Rating: Despite their relatively unknown status in the UK, STRFKR performed to a near capacity venue and gave everyone in the room a reason to just let themselves go. 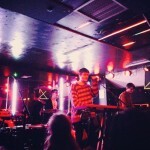 STRFKR are no strangers to touring but you could say that they are strangers to our side of the ocean. Embarking on their first ever full UK tour, the band started at London’s Hoxton Plaza and ended with a date at the Bodega Social Club in Nottingham. Wedged in the middle of the five British dates, the Portland four piece played in Edinburgh’s very own Electric Circus to an energetic crowd, and they showed exactly why their live shows are so well liked. Scottish band, Miracle Strip, were the one and only support band for the night and, from the couple of songs that I managed to catch*, I just…got them. Sometimes you see support bands and you wonder why on earth they’re supporting certain acts, but these local lads fit the bill just wonderfully. They were able to warm up the crowd just right for the headliners, and I definitely expect to see more from them. After just a short break, STRFKR took the stage and own it they did. Playing songs such as Atlantis and While I’m Alive, as well as their own cover of Girls Just Wanna Have Fun, they gave the crowd a perfect reason to just forget everything and everyone around them. Looking around, the entire room was moving from people full on dancing by themselves to others bobbing along with every single word that came out of the singer’s mouth. This show saw singer, Josh Hodges, and drummer, Keil Corcoran, swap places for a couple of songs, and this threw in a little more magic to the mix. With the venue having a strict curfew of 10pm, the band finished their set but found it difficult to ignore the Edinburgh chants of “one more tune!” over and over again. They threw caution to the wind and ignored any shouts that they may have received, playing that ‘one more tune’ for attendees and fulfilling everyone’s wish like asked. Their one final push, including them joining the crowd and sending everyone crazy, left everyone in the room more than satisfied and gave everybody a night that they’re sure to remember. They proved that they don’t particularly need the theatrics of their other shows and are more than able to give an amazing live show no matter the venue, the crowd size or whatever country they happen to be in. Big things are coming for them and, personally, I can’t wait to have them back on Scottish soil.